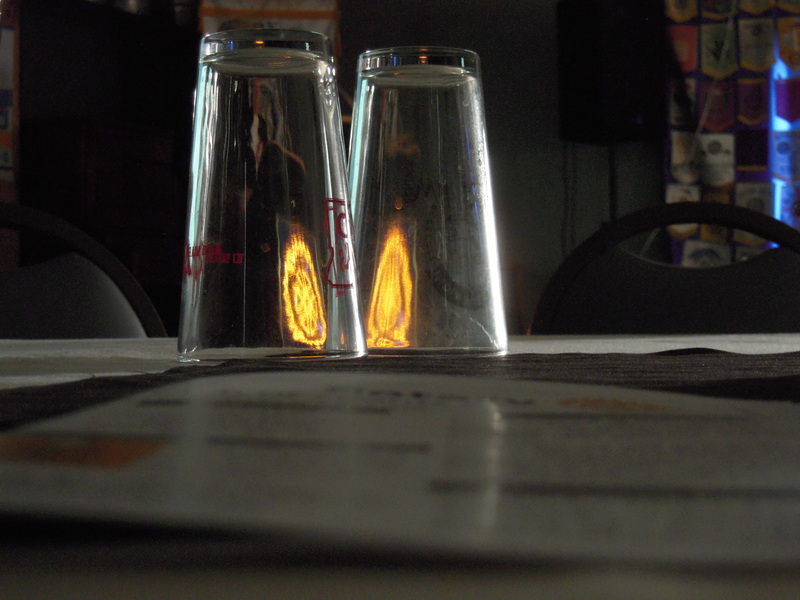 Our club photographer, Richard Acosta, has been faithfully recording meeting events on camera. His photos are posted here. Scroll through them by placing cursor over photo and click on arrows. 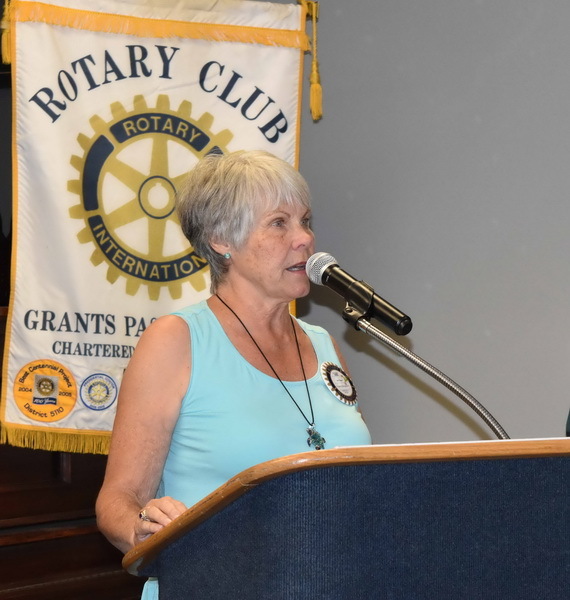 Pat Fahey Sgt at Arms, Peggy & Mary fairgrounds update, Peggy fairgrounds update, Lily gives a Jo Co update, Marion fellowship update. 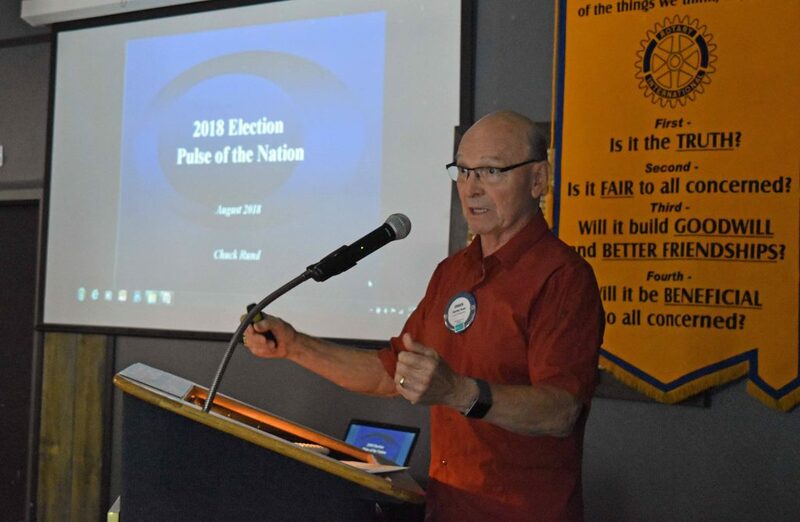 President Jean thanks Chuck for his presentation, Chuck Rund gives 2018 Election Overview. 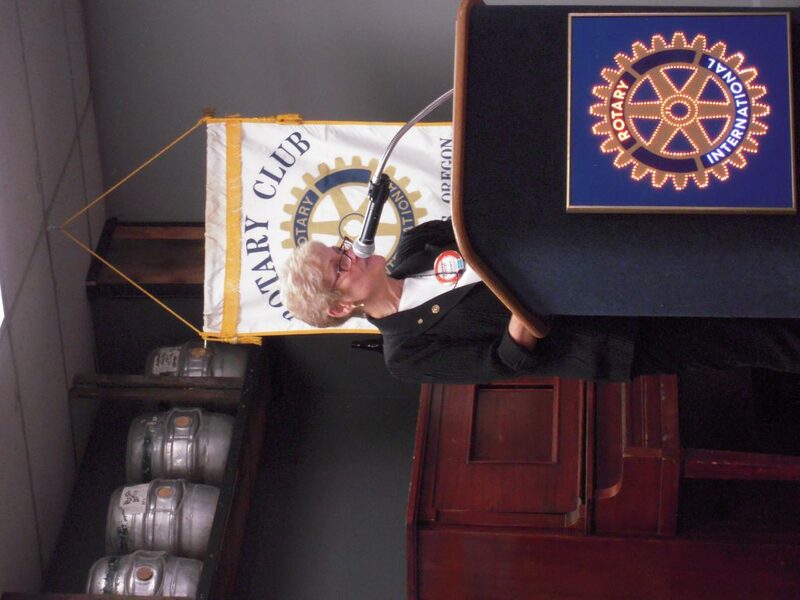 SOU President Dr. Linda Schott telling us about happenings at SOU. 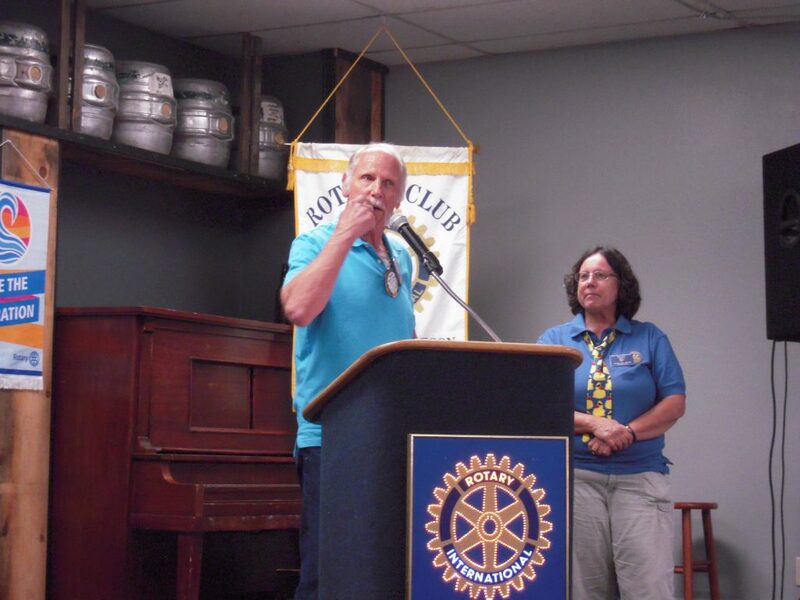 Our new Assistant District Governor Jim Polk graced us with a visit. Ann Bauer stresses the need for two more host families for this years exchange student from Thailand. Denis Roler announces Duck Sales will start on July 7 at the Growers Market. 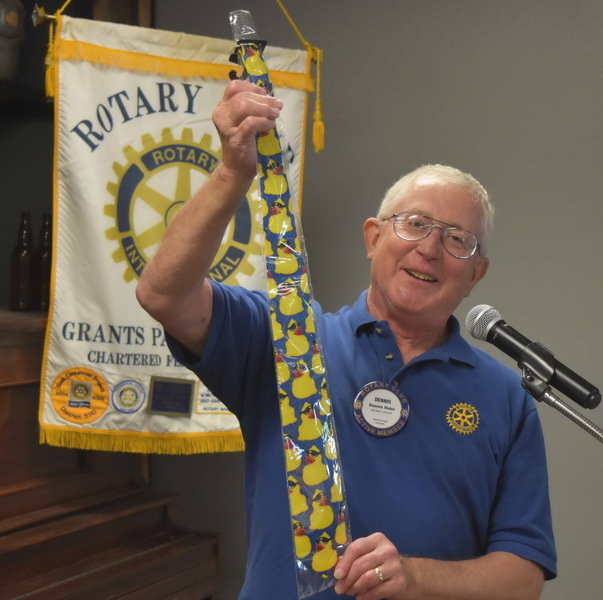 Dennis Roler shows the duck tie available to Super Quack Pack buyers. It’s a small world after all. Kate Lasky thanks President Cynthia for her support for the Imagination Library. 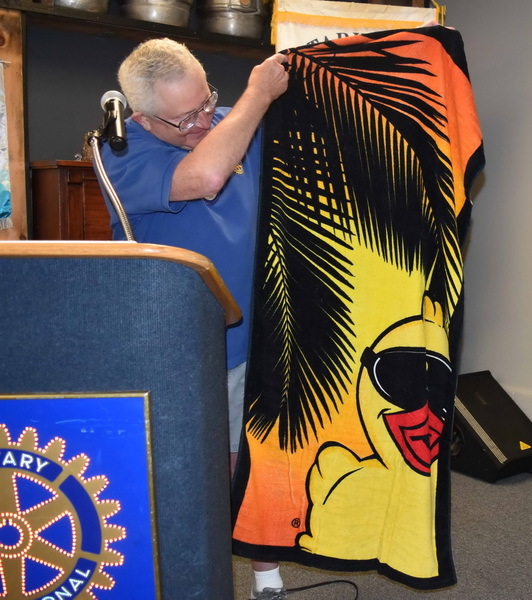 New Duck Towel also available to duck adoption purchasers. Peggy Anderson talks about big name at this years Fair. 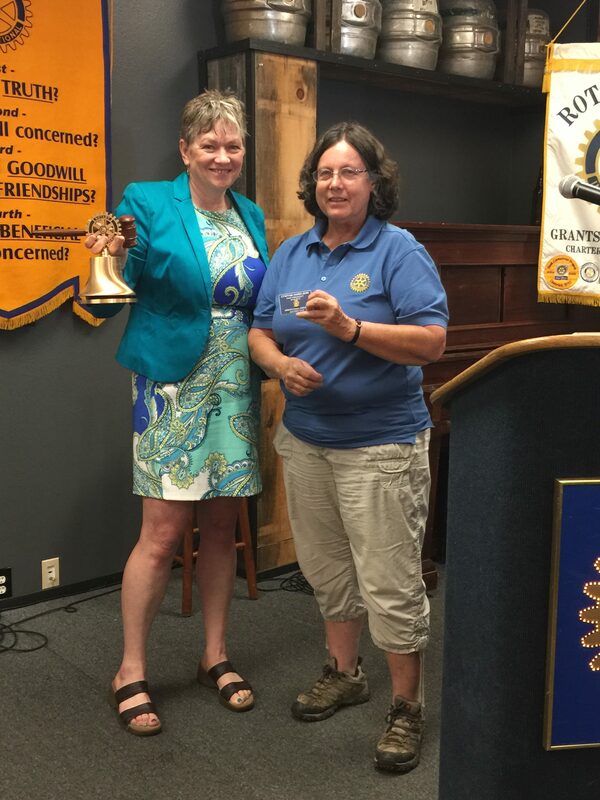 President Cynthia congratulates Cheryl Brown on receipt of Paul Harris Award. President Cynthia opens her last meeting by reciting the 4 way test. 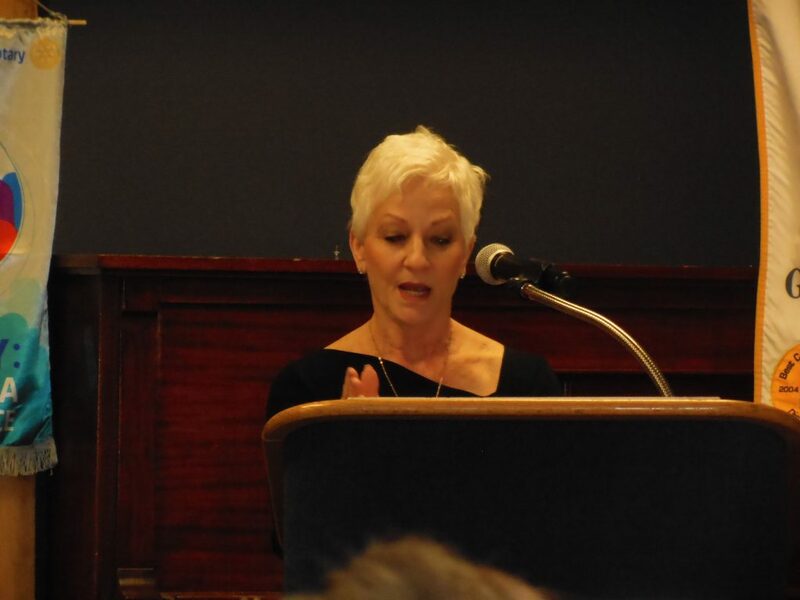 President Cynthia reminisces about her year in office. President Cynthia gathers with her Board and Directors for one last photo. Rob Brandes Sgt at Arms. Chris Mecca was our impromptu Sgt-at-Arms. President Cynthia presented a Paul Harris Award to her husband Tom, and welcomed Chris Cauble into the Paul Harris Society. B Wishes entertained us with her music. 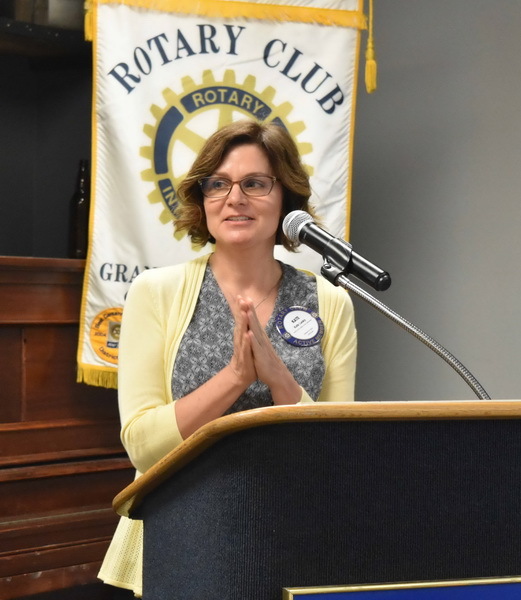 Ann Bauer seeks Sponsor Families, and Dana Thorp Patterson gives her vocational. Keith Heck is Sgt. 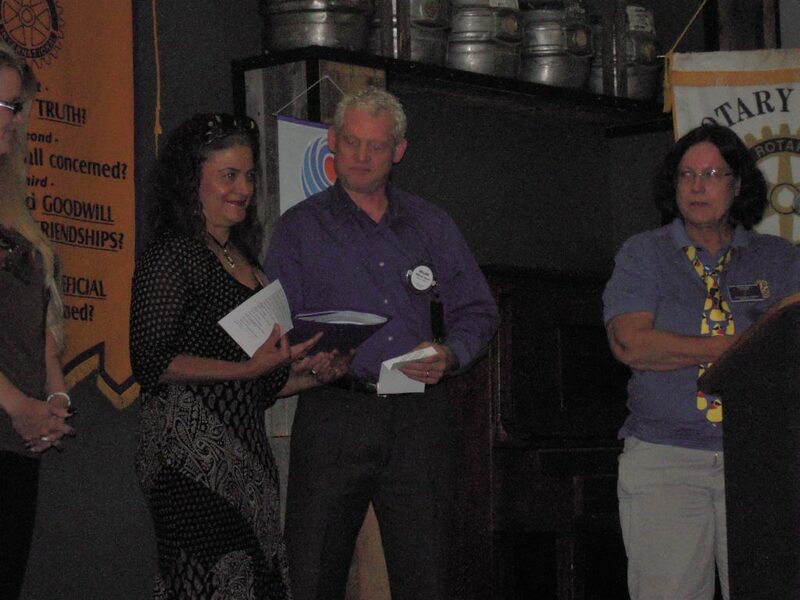 at Arms, and Shad Shriver makes a presentation to President Cynthia. 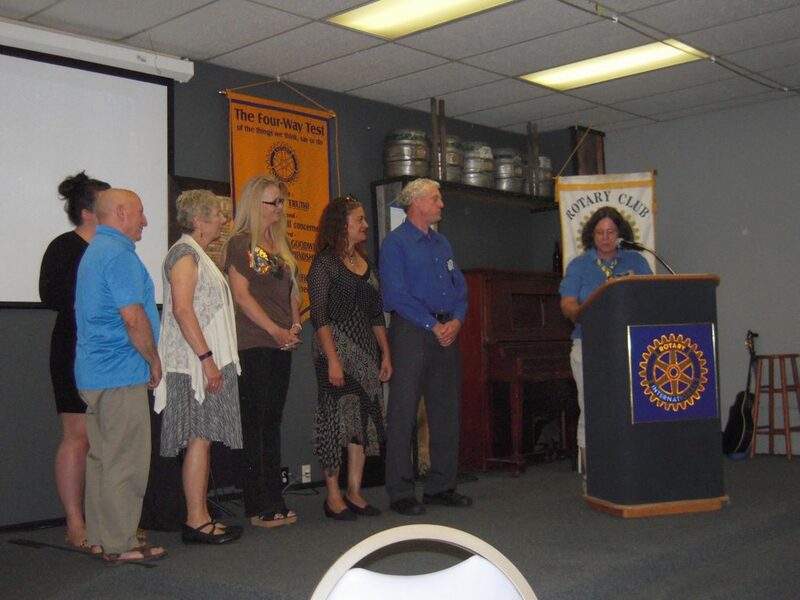 Josh Welch and Hyla Lipson present the Community Service Awards to: Community Bridges Foundation, Josephine Co. Food Bank, Maslow Project, White Oaks Farms Edu Ctr, Women’s Crisis Center, and Siskiyou Field Institute. The scholarship recipients for this year were presented. Midge presented Francesca Abusmas from North Valley HS. Terry presented David Moore Hidden Valley HS. 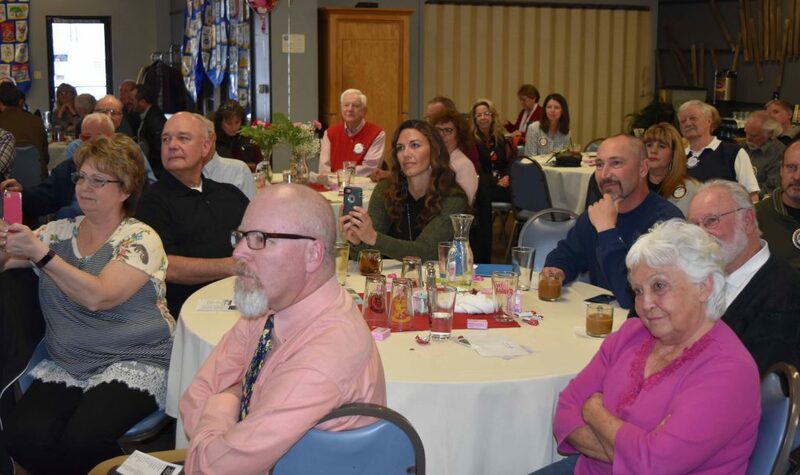 Gabriella Rapley from Illinois Valley HS was presented by Jim Polk of the Illinois Valley Rotary Clb, and Cliff presented Taylor White from Grants Pass HS. We were treated to an excellent Cello solo by Charlie Jarvis, a 9th grader at Grants Pass High School. He won the state championship in cello this year. Sister Julie was with him today, and they both sang for us at Christmas with Sounds Unlimited. Jenny Morin described her international travels with her traveling companion Tom. 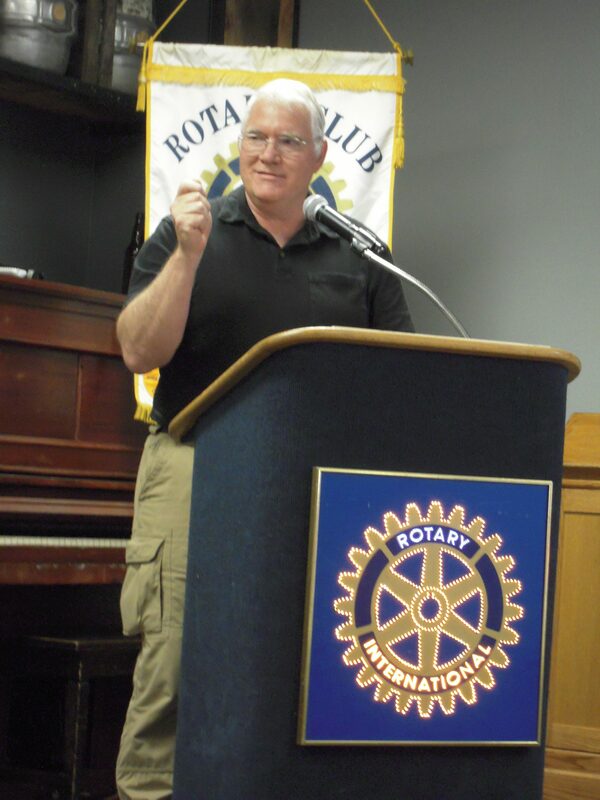 Rob Peil presented our inspiration on the essence of life and free hugs. Our visiting interact students preent a check to Polio Plus. 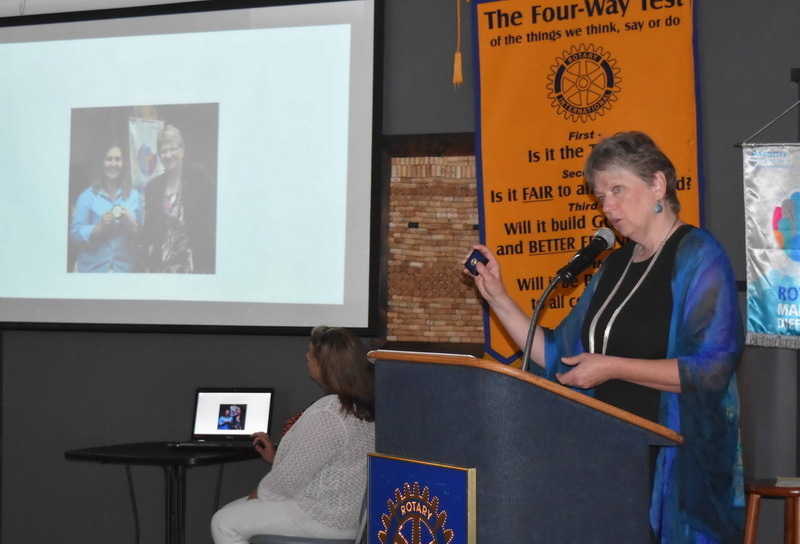 Outbound exchange students David Schmidt and Lucy Roberts talked about their upcoming visits to Germany and Thailand, respectively, and were congratulated by President Cynthia and Ann Bauer. Rob Brandes was our Sgt. at Arms. 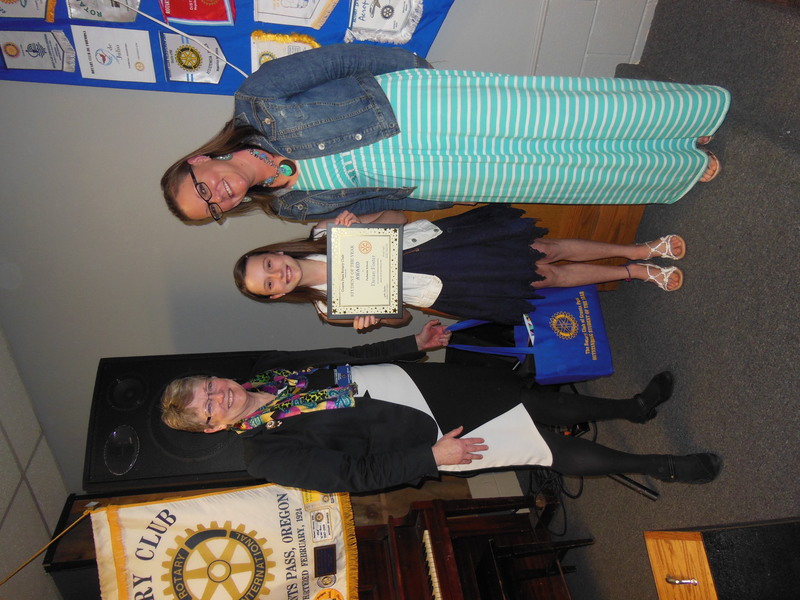 Our Student of the Year was Hadley Goodnow, a 5th grade student from Williams Elementary School. She was introduced by her principal Steve Fuller, and is shown with her parents Tina Wright and Steve Fuller. 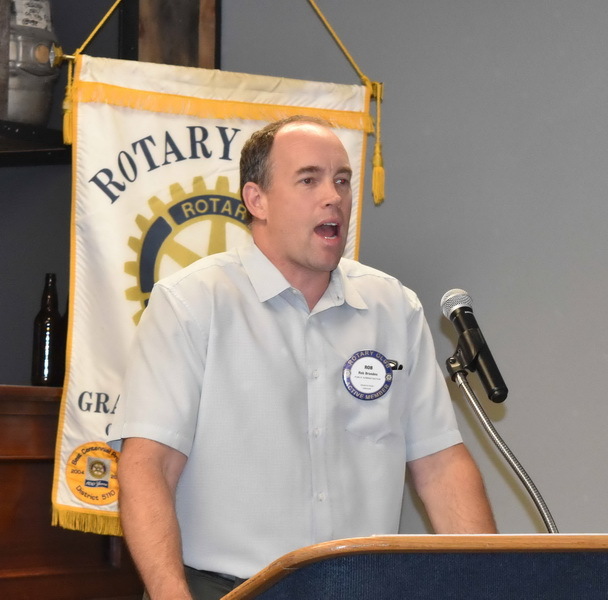 Jim McCafferty joins the Polio Plus Society, and Cameron Camp presented the program on cyber security. 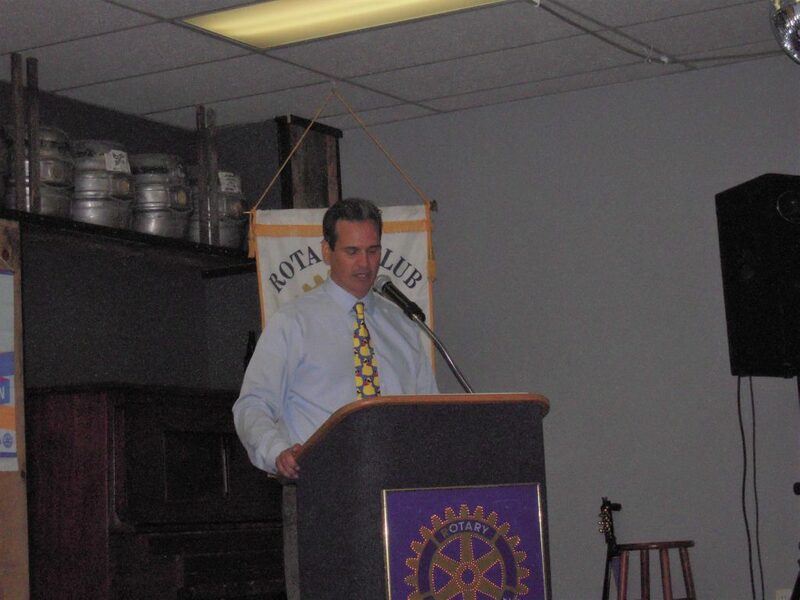 The Sgt at Arms highlighted the Rotarians who had participated in the Rotary Track Meet as athletes over the years. The program was presented by the Group Study Exchange visitors from Guatemala. Pat Fahey and the Faheyettes lead us in a rendition of “Itsey Bitsey Spider”. Today’s Student of the Year is fifth grade student Ebonnie Hays from Riverside School, introduced by her principle Rob Henderson. Her parents are Ginger and Jeff Hayes. Our Sgt at Arms was Terry Soeteber. 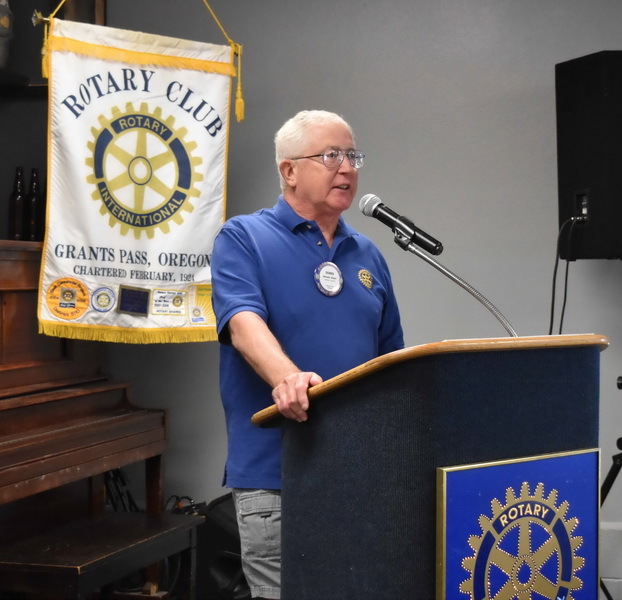 Members of the Grants Pass High School were there to promote the upcoming track meet, and James Boston presented some facts about Polio Plus during breaks in the Polio Plus Pie Auction. Student of the Year is Meira Rice from North Middle School. Tim Dwyer receives a Paul Harris +3 Award. Chris Monroe assisted Al Francis with the song and pledge. Our Student of the Year was Sydney Moore, an eighth grader from Fleming Middle School. She posed with her parents Travis and Vickie Moore. Bob Sitov urges us to mark down our hat size and get ready for the track meet. Chris Mecca performs another true/false quiz. 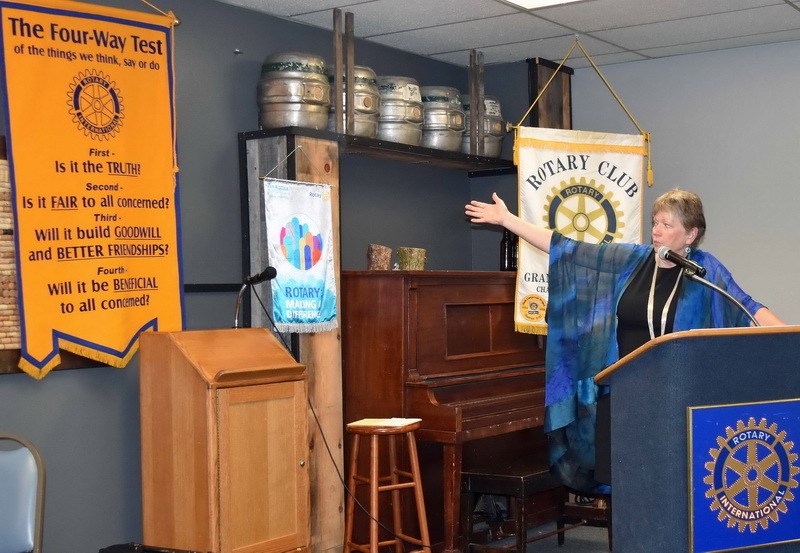 We had a 2 part program, with Chris Monroe presenting his vocational followed by a presentation by Kate Lasky and Rebecca Stoltz on the Imanigination Library. Kate and Rebecca then pose with Dolly Parton, who is responsible for initiating the program nationwide. Student of the Year Emma Catania is an eighth grade student at Lincoln Savage Middle School Her parents are Brent and Stephanie Smith Emma was introduced by her principal Mark Higgins. Sergent at Arms Barbera Bean’s subject was things we have learned from our spouse. Ann Bauer presented a $2000 check to our outbound student to Thailand. 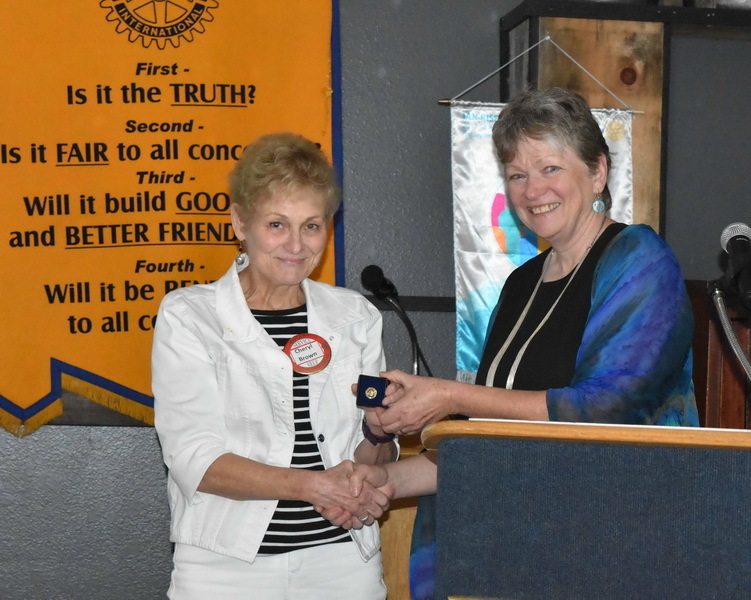 President Cynthia presented Ann Rusk with a Polio Plus Society certificate, and Catherine Healy with her Blue Badge. Chuck Rund introduced our speakers Chris Mecca and Buck Baker, who gave a very entertaining presentation of their trip to Antarctica. 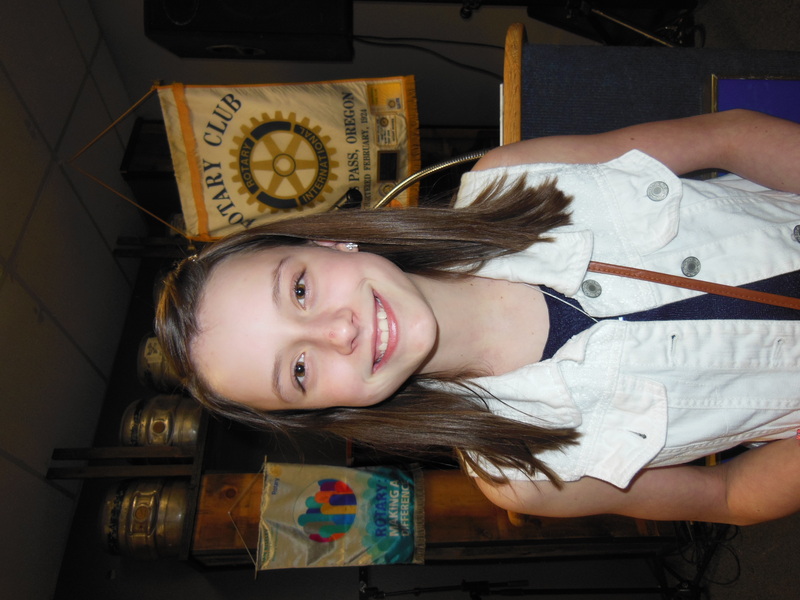 Today’s Student of the Year is Grace MacDonald-Clark from South Middle School. She was be introduced by her principal Jeff Weiss. 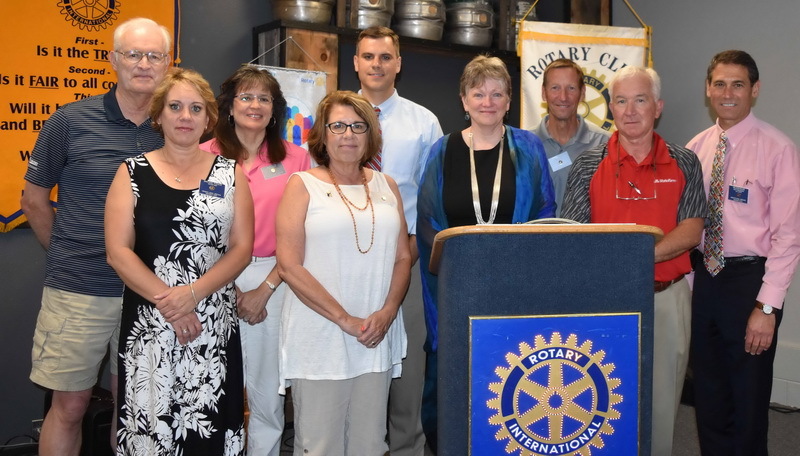 Two new members, Wendy Bennett and Cheryl Brown, sponsored by Gabrielle DiMatteo and Ann Bauer, were welcomed into the club. Ben Smith and Julie Thomas shared their vocationals. 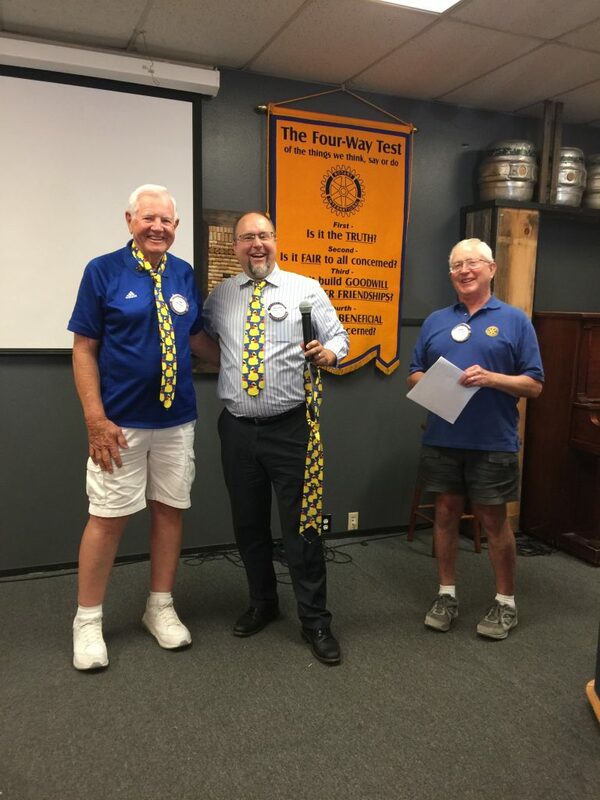 The inspiration was presented by Rob Pelle, and Terry Soeteber was our Sergent at Arms. William Brust received his blue badge, and posed with his wife Carmen. son Sam, and Pres. Cynthia. The program on Dog Behavior was presented by JP Barrett and his assistant, Bama. The Inspirational was presented by Jim Dyck. 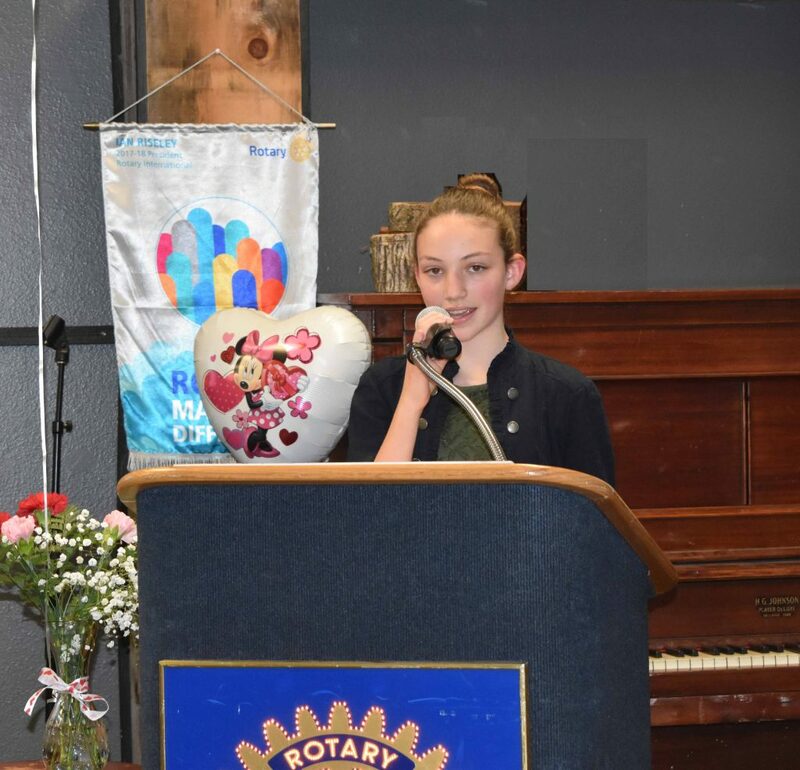 Rotary Student of the Year is Levin Cynor-Ford from Fruitdale Elementary School. He is introduced by his Principal Heather Yount. 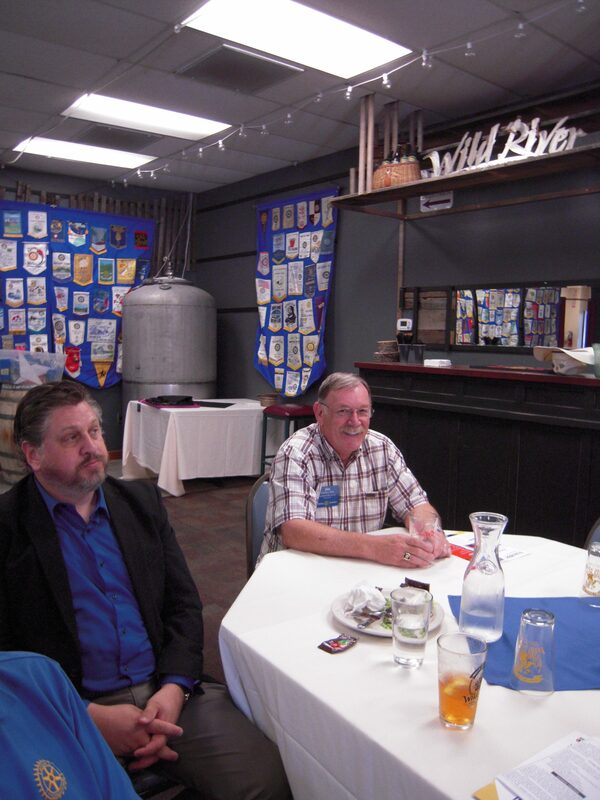 Benjamin was welcomed into the Polio Plus Society, and Greg Roe received his blue badge. 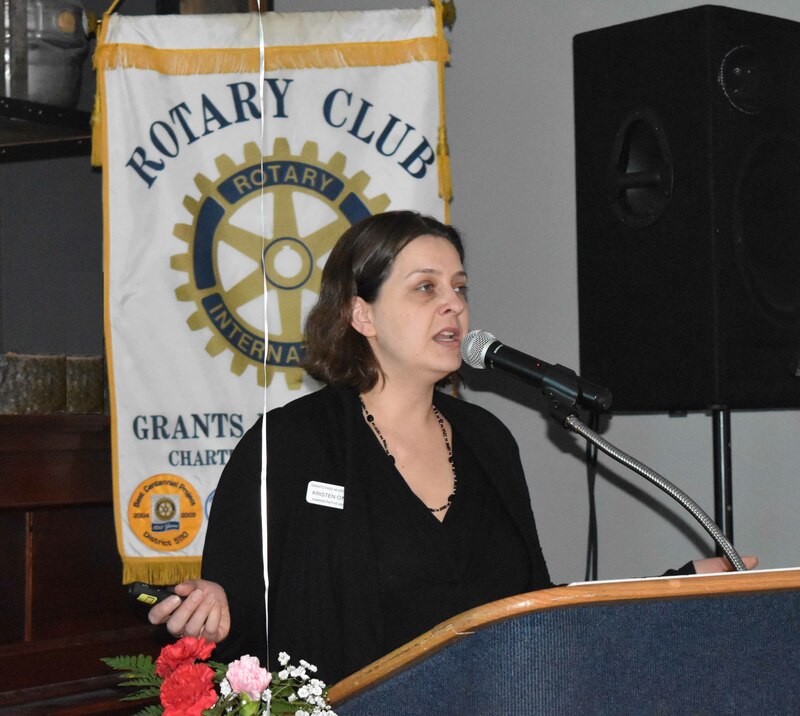 Ourspeaker Kate Lasky discussed how the recent tax measure has benefitted the county library. In a reference to a disruption last week, Chris Mecca started the meeting requesting that those who are legally parked should all sit down. No, Marty Bauer is not kissing Bill Ertel. 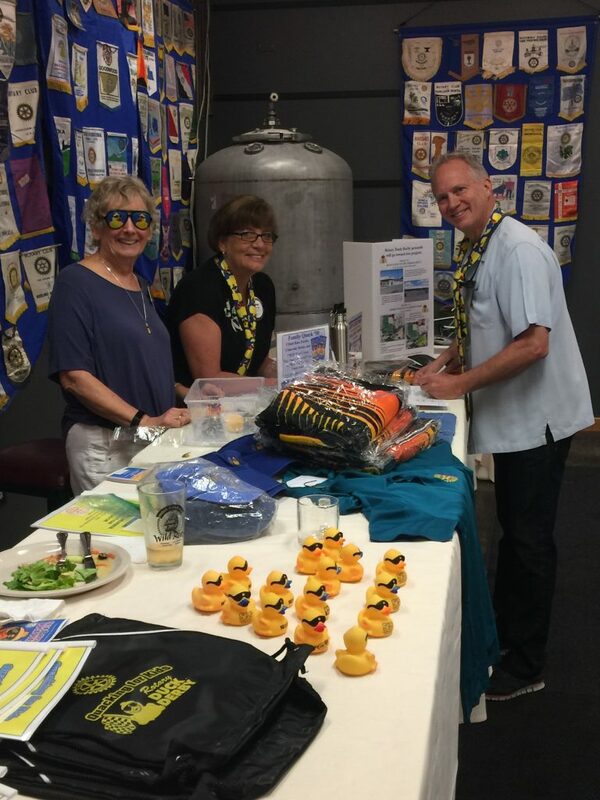 Sgt at Arms Cherryl Walker reminded us that this is the anniversary of our club’s founding. 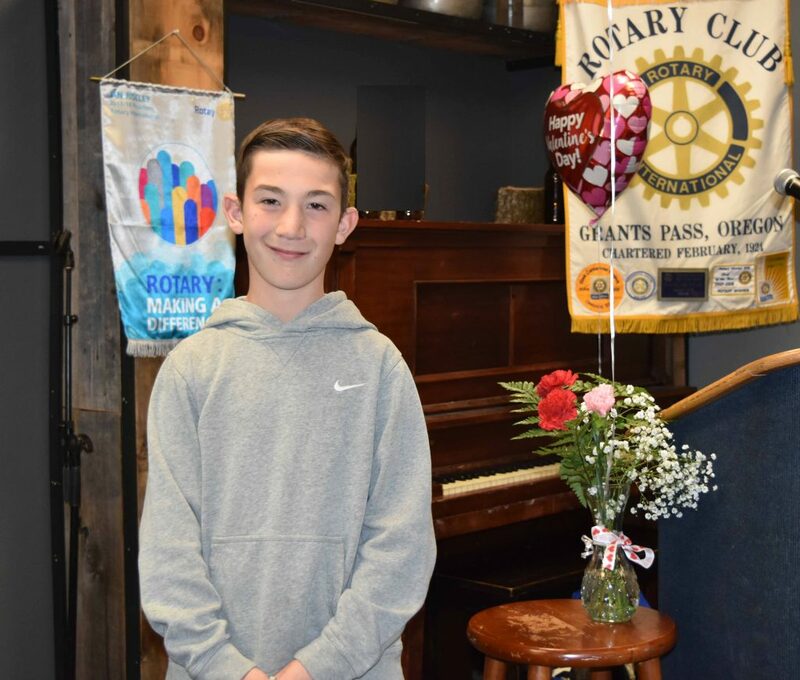 Rotary Student of the Year is Owen Hull from Lincoln Elementary. He is introduced by his Principal Missy Fitzsimmons. Catherine Healy and William Brust presented their vocationals. Samantha McLean presented the inspiration. 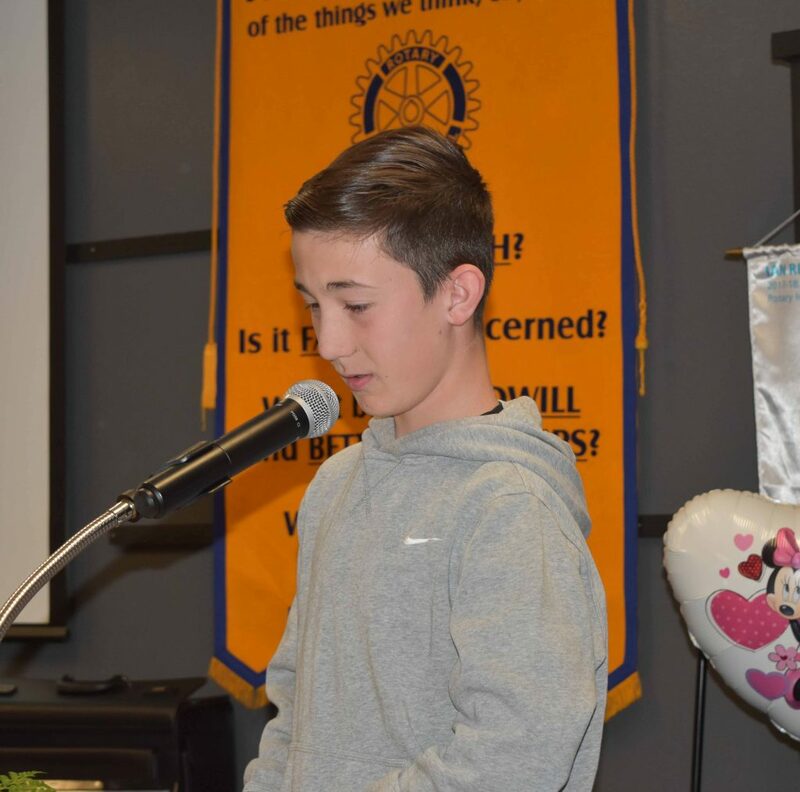 Rotary Student of the Year is Bradley Quist from Sunny Wolf Charter School. He is introduced by his Principal Penelope DiGennero. 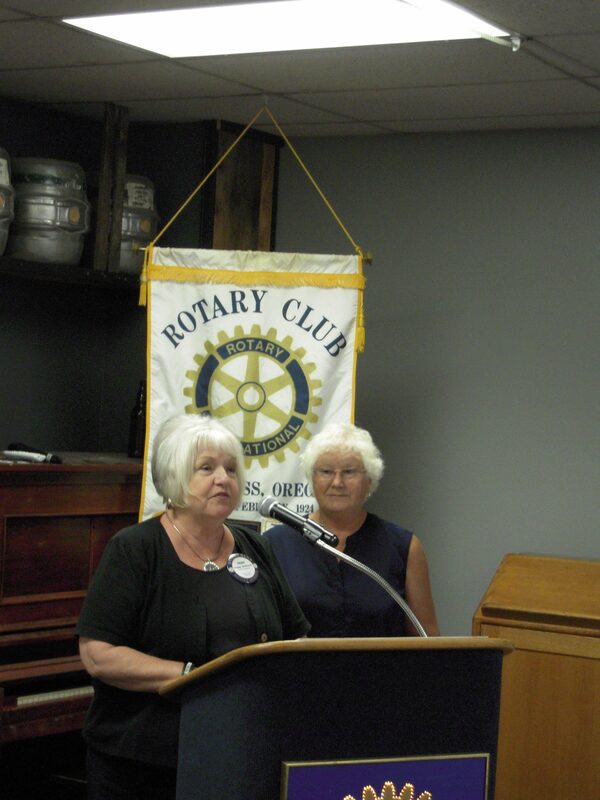 President Cynthia introduced the latest new member Dana Thorp-Patterson sponsored by Bill Thorp. 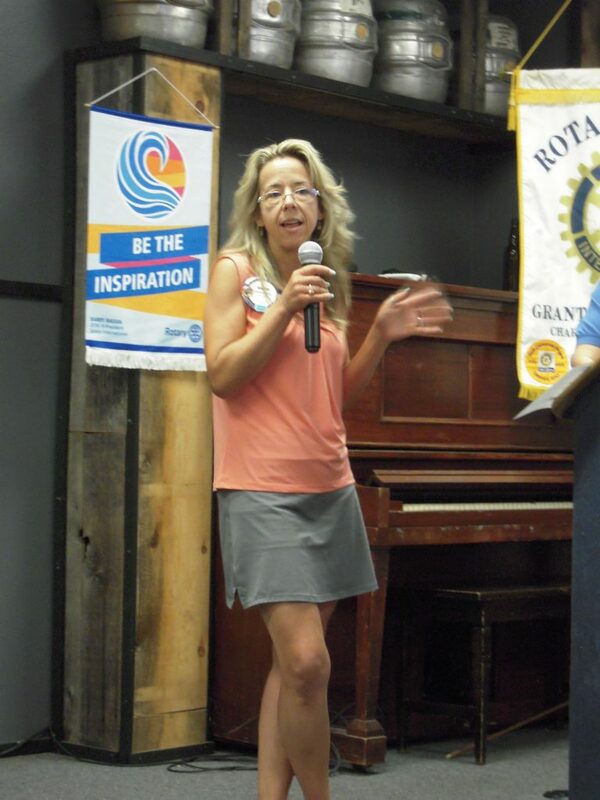 Jennifer Morin, introduced by Fred Borngasser, filled in for In-N-Out Burger, presenting a progam on getting Organized. 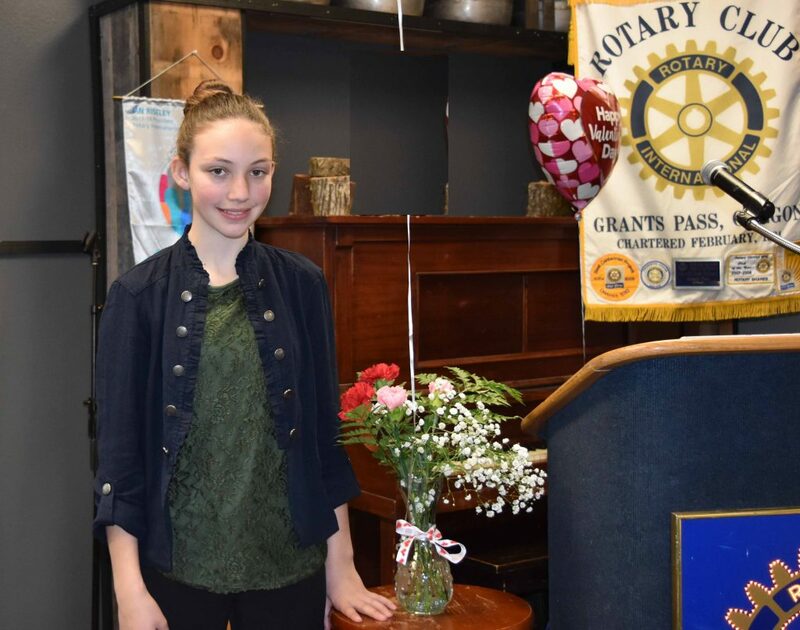 Feb 14th Rotary recognized Applegate Student of the Year Maria Cross who was introduced by her teacher Michele Daw and accompanied by her Parents and Principal Steve Fuller. Also Applegate Student of the Year Max Vidlak who was accompanied by his parents, Grand Parents and principle Steve Fuller. Rotary President Cynthia Haralson presented the student of the Year Award along with a bag of goodies. 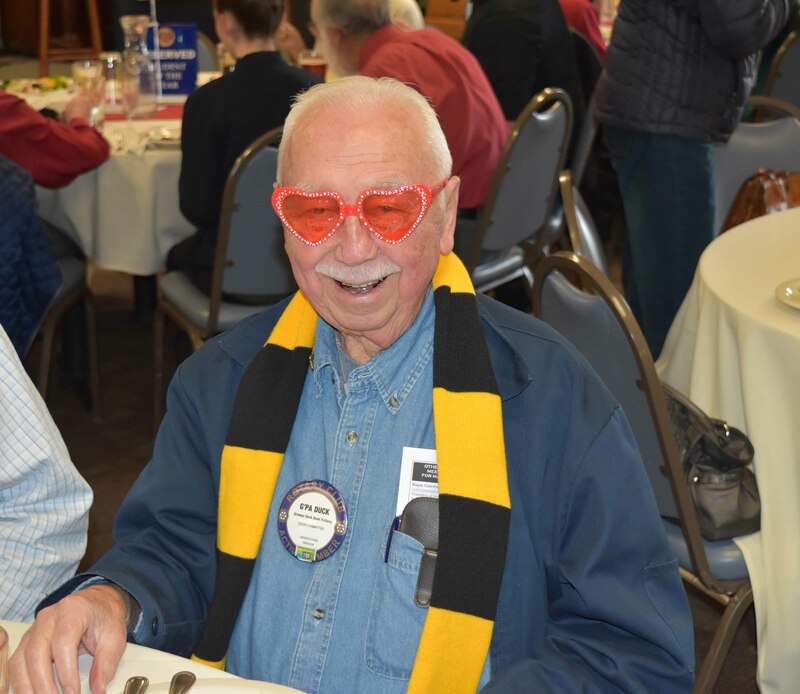 G’Pa Duck was feeling the love as he Celebrated Valentines Day in his nifty heart glasses. Hyla Lipson talked about what’s happening with the GP Museum of Art and introduced Kristen O’Neill who gave the club a short 30,000 year art history lesson. Terry Soeterber used his Sergeant at Arms platform to provide a remembrance of Dan Hughes. Owen Boersma from Highland Elementary School is introduced as this week’s Student of the Year. 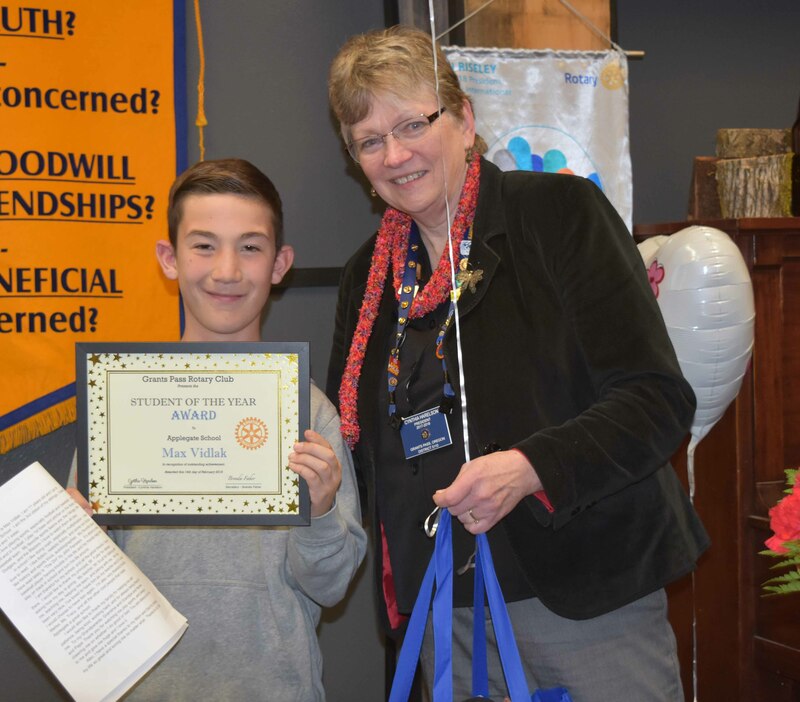 President Cynthia presented a Polio Plus Society Certificate to Josh Balloch. Today’s program was vocationals. Susan Seereiter introduced Melissa Hays and Lawton Lesueur introduced Greg Roe. 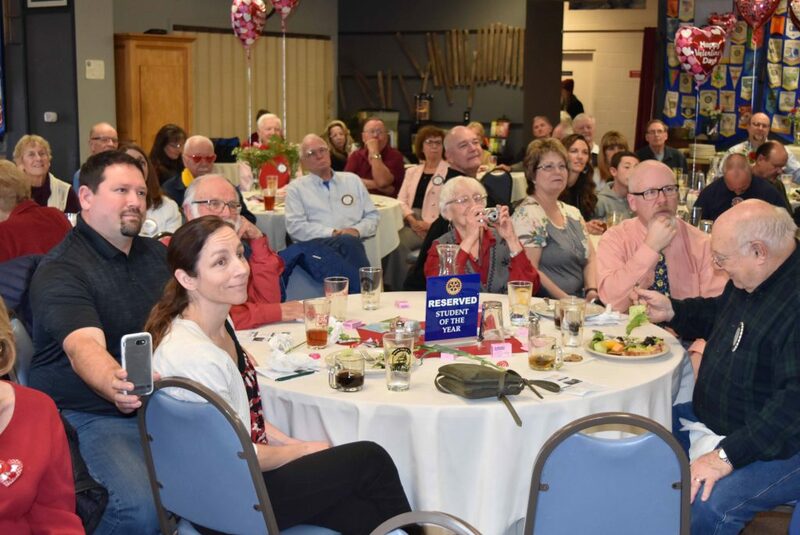 Feb 7th Meeting Pictures – Information Coming Soon! Chloe DeCourcey from Manzamota is introduced as this week’s Student of the Year. Mike Peil receives his multiple Paul Harris award. 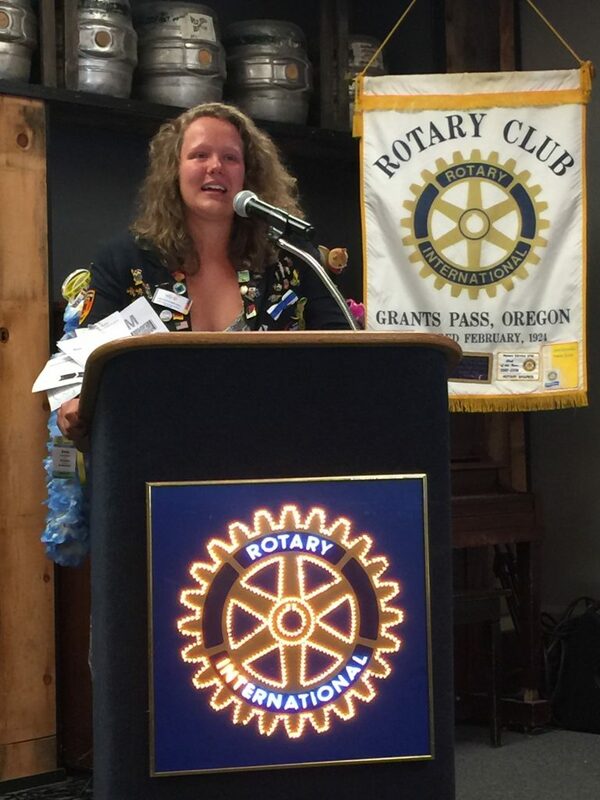 Summer Ashley thanks Rotary for making her exchange to Japan possible. Our speaker Noah Strycker tells of his quest to set the record for the most bird species to be observed in a single year. 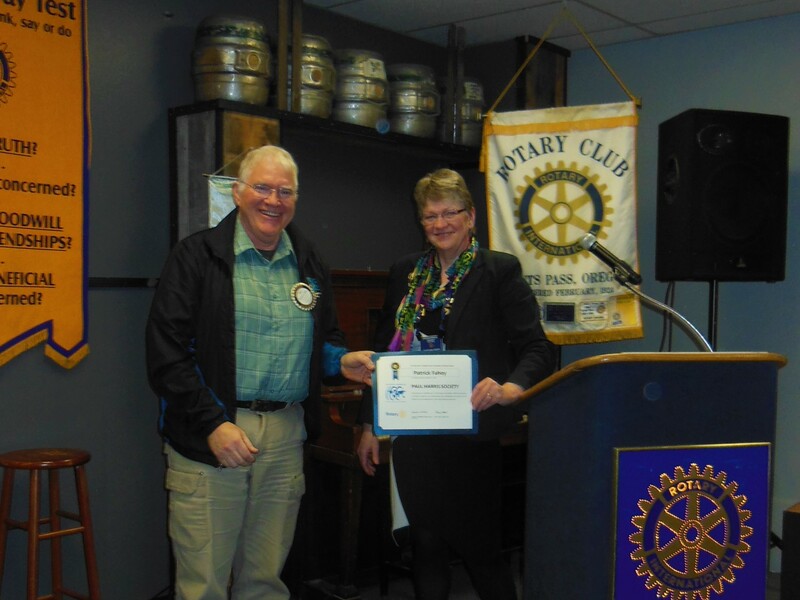 Jan 3: President Cynthia introduces Sgt at Arms Tim Dwyer. This week’s Student of the Year is Angel Sandoval from Madrona Elementary School. Ann Bauer wins the gift basket and Richard Acosta’s snowflake from the drawing benefiting Polio Plus. 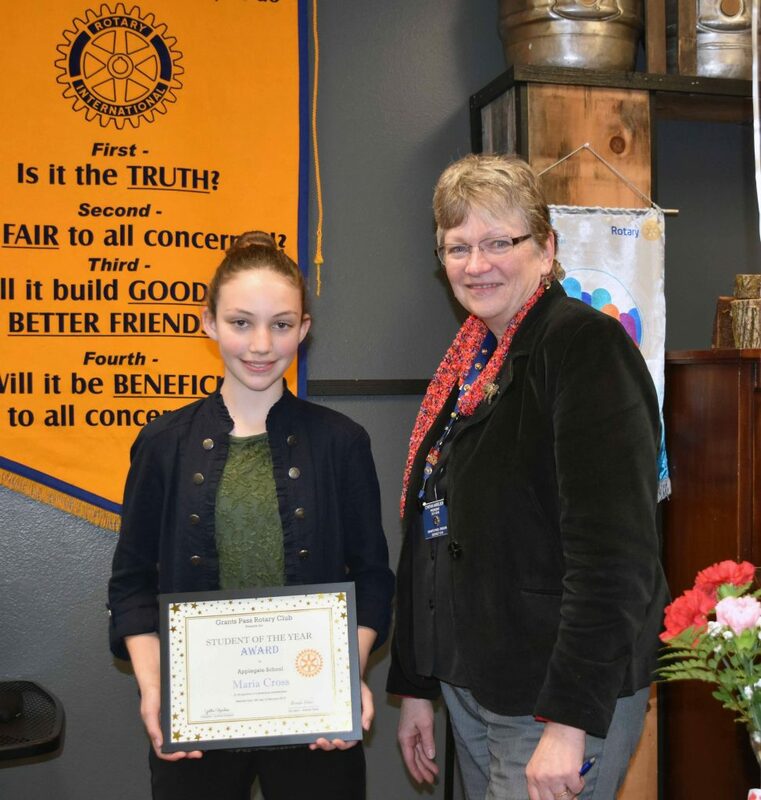 Jan 10: President Cynthia presents “thank you” collection to the Wild River Pub service staff, and introduces Student of the Year Chloe Daywitt from Allendale Elementary. 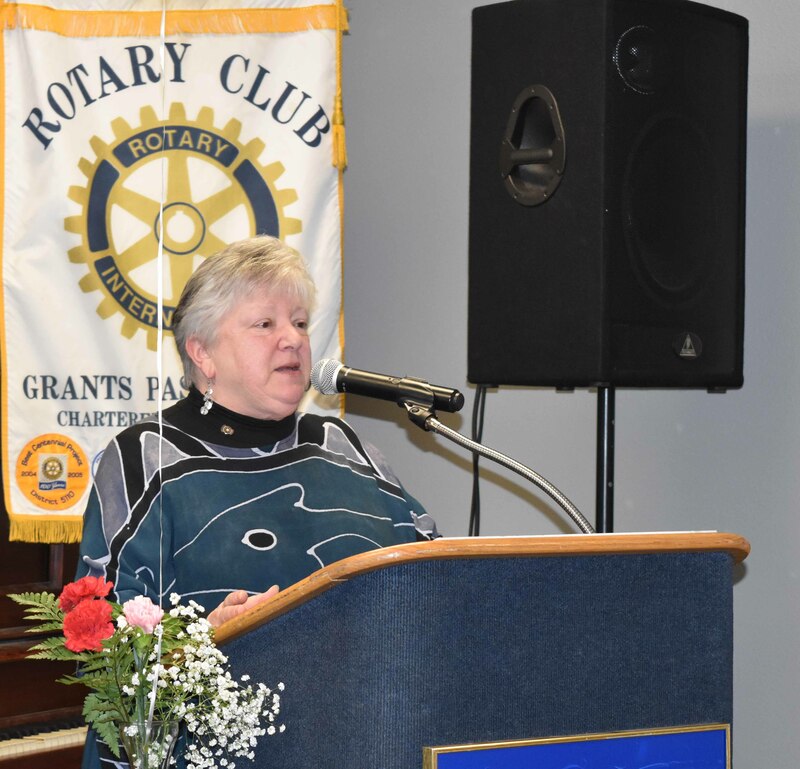 District Governor Claudette McWilliams welcomes new members Benjamin Smith and William Bruss, then presents her update on what’s happening in the District. 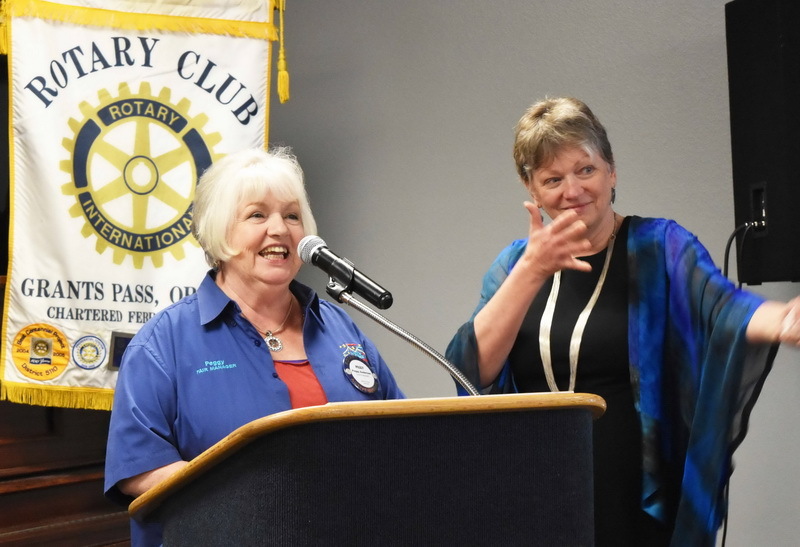 She presents a Presidential Citation to Nelson Maler for an outstanding 2016-17 Rotary Year. 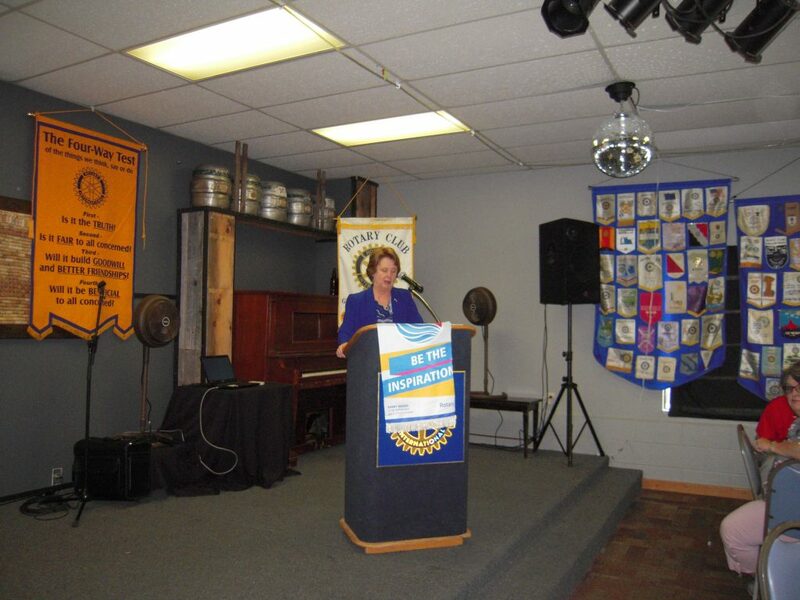 Jan 9: District Governor Claudette McWilliams meets with the Board of Directors and Committee Chairs. 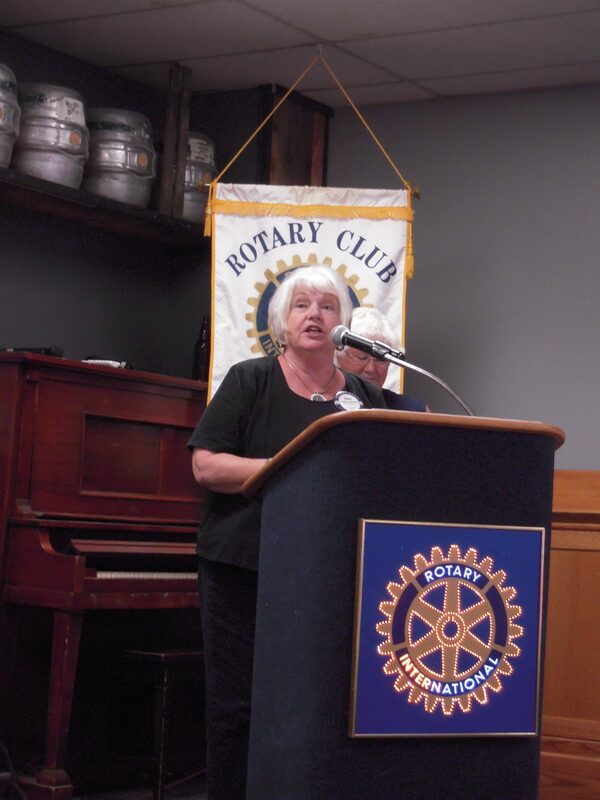 Dec 27: Song Leader Kathy Chelminiak called on all of the Past Presidents to help say farewell to the old year. Pat Fahey’s Inspiration was a remeberance of Dan Hughes who passed away this past week. Hyla Lipson introduced author Leslie Compton. Leslie discussed her book about Teddy Roosevelt’s Great White Fleet, after which she was thanked by President Cynthia. Dec 20: Song leader Terall Blalock leads us in an inspiring rendition of “have a Holly Jolly Christmas”, Bill Ertel adds his Christmas inspiration, and Rob Brandes further inspires us to listen to each other this Christmas. 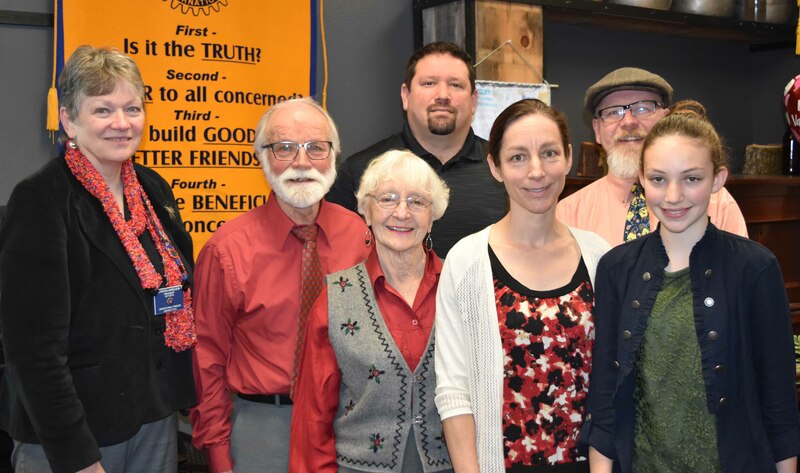 If that wasn’t enough inspiration, the Sounds Unlimited from Grants Pass High School entertained us with the annual Christmas music performance, after new member Julie Thomas, sponsored by Nelson Maler, was presented her Red Badge. Dec 6: Sergeant at Arms Chris Mecca complained that he never gets his picture taken. He actually does, but maybe he doesn’t know it because, as you can see, he is not watching! Don Porter presents winners of the Paul Harris Duck Race, and Megan Pratt receives her certificate for the Polio Plus Society. Terry Soeteber, former Juvenile Justice Director, introduced our speaker Jim Goodwin, the present Director. Nov 1: George Trahern receives his blue badge, Rob Brandes conducts an election of the worst Halloween treats, and speaker Scott Stoddard does a presentation on the Grants Pass Daily Courier. Oct 4: Polio Plus Pie Auction, with Chris Cauble the winner. 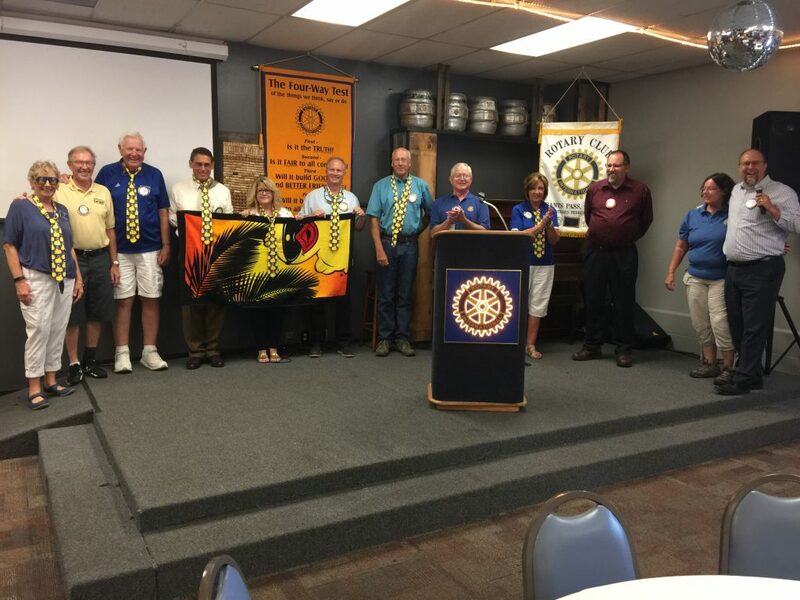 Dennis Roler presents the Duck Derby report, awarding checks to the beneficiaries and thanking our sponsors. Sep 20: Fred Borngasser is honored for his last place finish in the Paul Harris Duck Race, Rob Pelle gives us a lesson in understanding reality, and Officer Donaghy explains the new cell phone law. 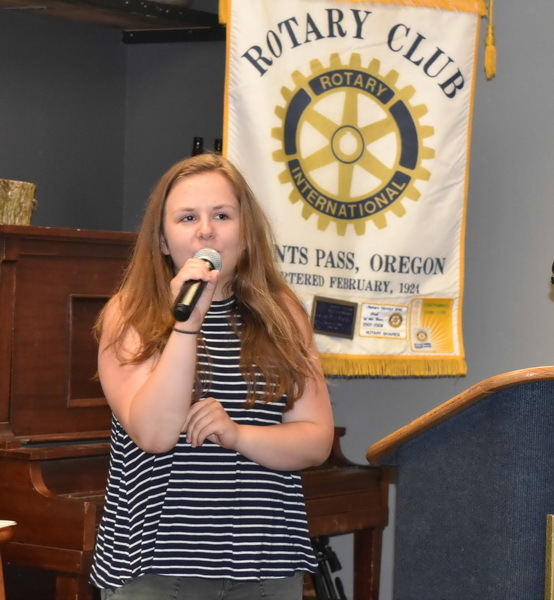 Returning exchange student Maya tells of her time in Germany. Nelson Maler is presented an honorary diploma. 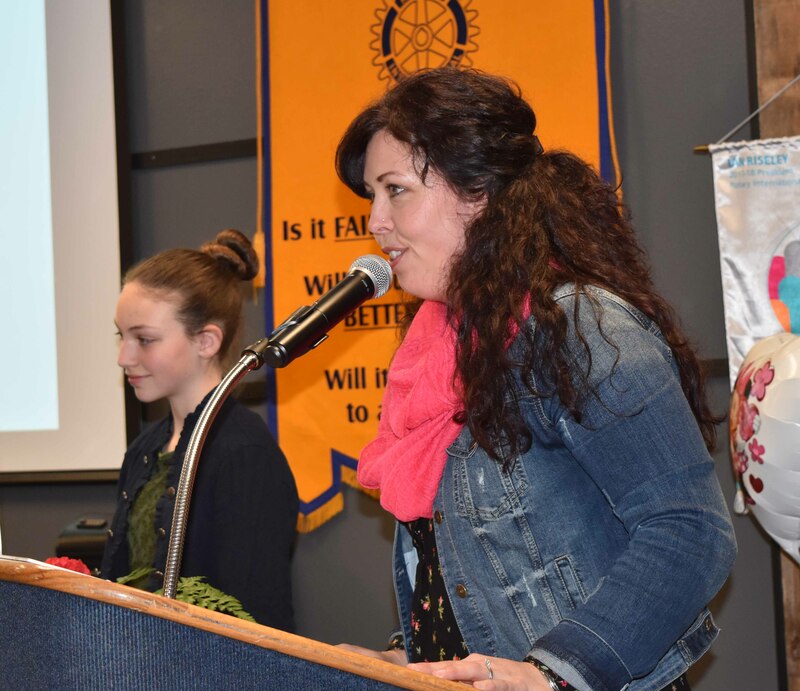 Dec 13: Rotary Exchange Students Anna Mohrmann and age Ashley talked about their experiences. They were introduced by Ann Bauer, and exchanged banners with President Cynthis. Anna is an inbound student from Germany, while Ashley was an outbound student to France. 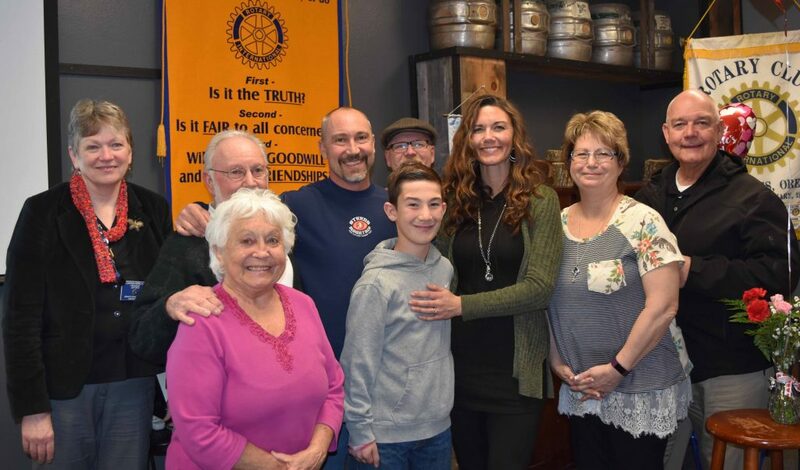 Ashley also introduced her parents, who were present in the audience. 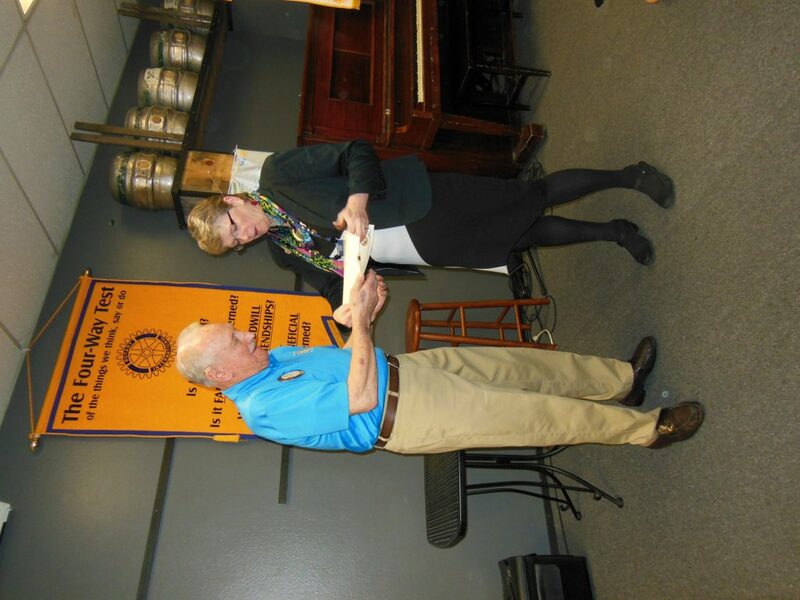 Nov 15: Veteran Harry Mackin from Rogue Gateway Rotary honored our Veterans. Nov 8: Lawton Lesuer and David Morrison receive their Blue Badges and Catherine Healy receives her Polio Plus Society Certificate. Our speaker, Chief Bill Landis, is introduced by Terry Soeteber. 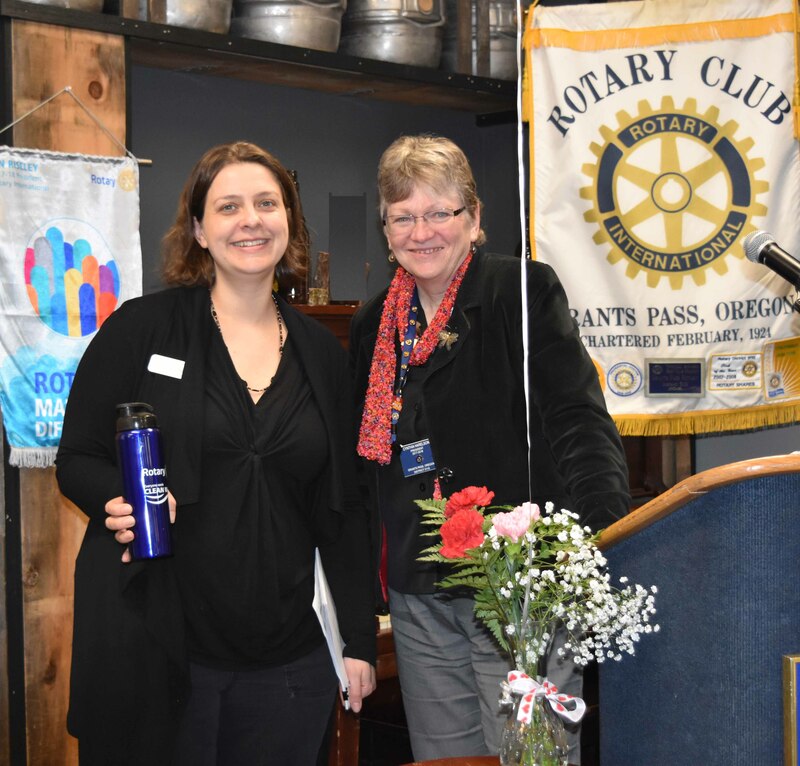 After his presentation on Grants Pass Public Safety, President Cynthia presents Chief Landis with a the speakers gift, a water cup in recognition of Rotary’s commitment to clean water. Oct 25: Terrall Blalock and crew lead the song. Pick your favorite Terall picture. Cherryl presents our inspiration, Timari Davis and Megan Pratt get their blue badges, and Timari also receives her Polio Plus Society certificate. Nelson answers questions on Polio Plus. Josh and Lawton present their vocationals. 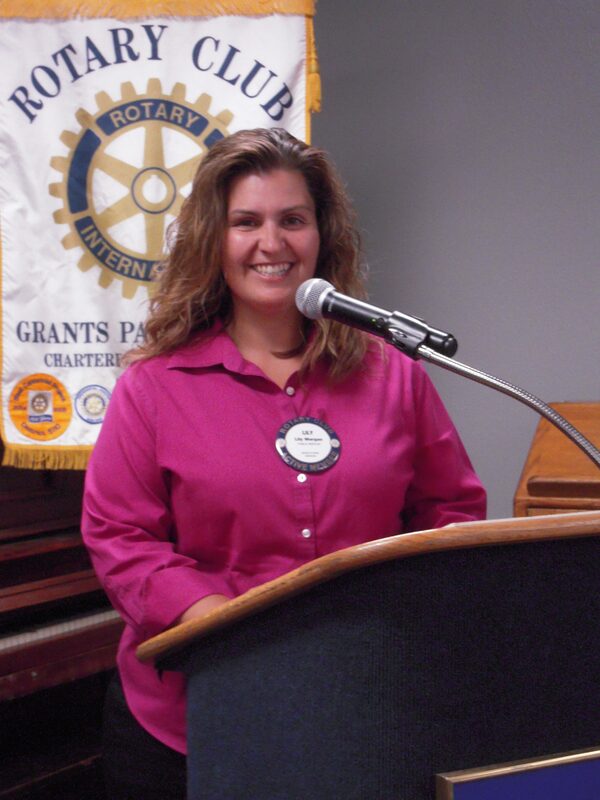 Sep 27: New member Melissa Hays, sponsored by Susan Seereiter. 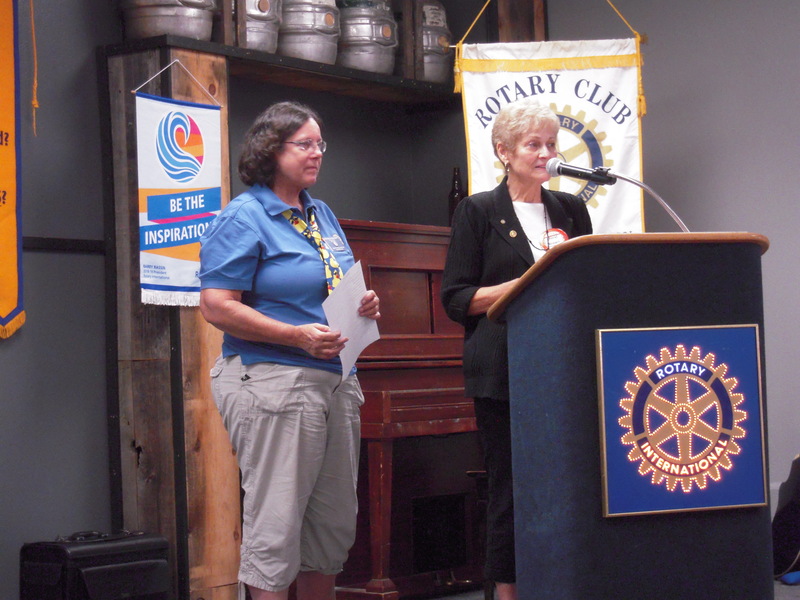 President Cynthia presents certificates to club members who won Duck Derby Prizes. Chris Cauble and Megan Pratt presented their vocationals, introduced by their sponsors Fred Borngasser and Timari Davis. Sep 13: Kevin Widdison, introduced by Barbara Bean, made a presentation on the Food Bank. 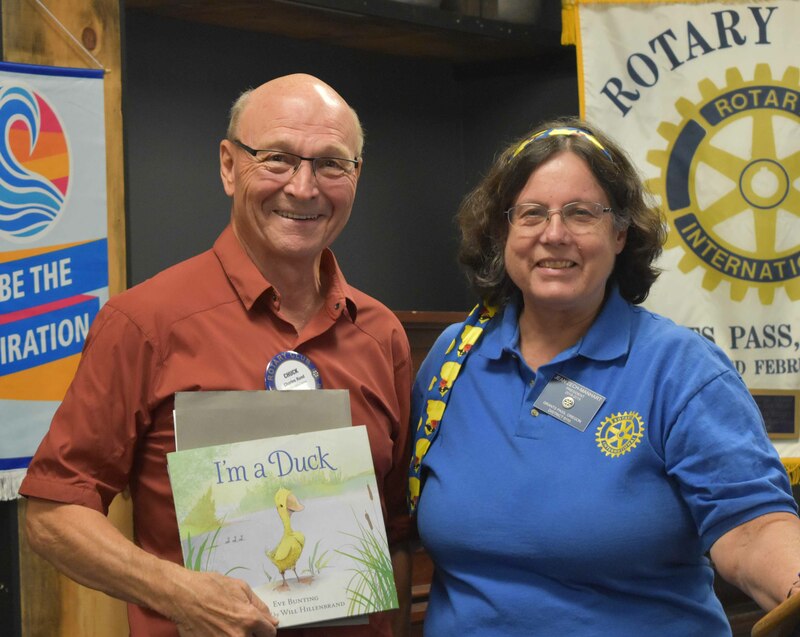 Sept 6: Don Porter promotes the Paul Harris Duck Race, Ruth Berkey reported on duck sales to date, and Bill Thorp presented a Rotary Moment. Roy Lindsey introduce the speaker, Carrie Prechtel, who discussed the 211 Health and Social Services information service.